Now that you have all of the equipment that you need for home brewing, the next thing that you need is some ingredients to use all with all of that equipment. 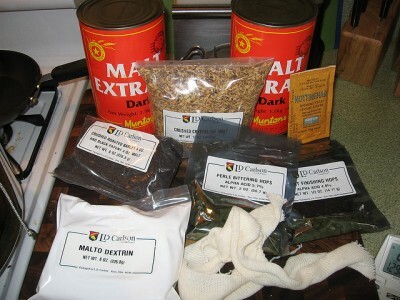 You can either buy all of the ingredients individually or many homebrewing shops sell recipe kits that include all of the ingredients to brew up a batch of beer. Ingredient kits start out at about twenty dollars for the bare bones and go up from there. I’ve seen a couple of kits that were in the eight dollar range, but these were also some pretty intensive beers. Depending on the recipe kit, you may or may not be saving money instead of buying everything separate. However, you are buying easier because you know that you’re buying everything that you need to make a certain recipe and you won’t realize when it’s too late that you’re missing something. Unless of course, the home brewing shop messes up, but that’s another blog post. The major drawback to recipe kits is that you’re limited to the recipes that you can make because you can only brew what kits the home brew shop has. Buying all of the ingredients separately allows you to make any recipe you want, as well as experiment to come up with your own creations. When new home brewers are starting out, I would suggest starting with an extract recipe kit. It’ll give you most of the ingredients that the big boys use, plus you know the recipe is tried and tested so everything will turn out all right with your beer. Then, once they’re comfortable and ready to start experimenting, try adding some ingredients to customize the recipe kits. Not too long ago, I brewed a strawberry wheat beer that was just a wheat beer recipe kit with strawberry extract added. Simple, but really different from just you’re average wheat beer. And finally move onto buying all of the ingredients separately to follow already created recipes or to make their own beers.